Why can't the weekend be just one day longer?! I am exhausted from an exciting weekend in Athens celebrating my 25th birthday. Thank you to everyone who made my birthday so special! I am so ready for Christmas- no shame I started listening to Christmas music this morning. 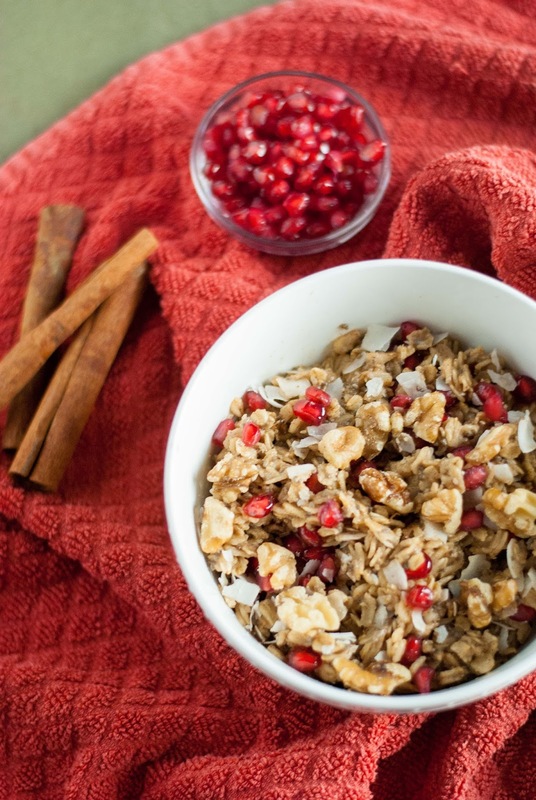 To get your tummy in the holiday spirit, look no further than this cinnamon & pomegranate oatmeal. It gives me all the holiday feels! It seriously is Christmas in a bowl! 1. In a saucepan over medium/high heat, bring milk to a boil. 2. Once boiling, turn heat down to low and add in the oatmeal and chia seeds. Let simmer for about 5 minutes, stirring frequently. 3. Once most of the milk is absorbed, remove from the heat and stir in the syrup, butter, coconut sugar, and cinnamon. 4. Stir in the coconut flakes and pomegranate seeds and then top with walnuts. Enjoy!